The Magothy was formed 10,000 years ago when rising sea level marking the end of the ice age flooded river and creek valleys, creating a series of sub-estuaries. The rising sea buried the land within the Magothy River valley and, with it, the remains of its earliest inhabitants. We can only speculate about the Indian culture that existed in the area 10,000 year ago. Artifacts from nomadic tribes lived along these shores date back to 5,000 – 1,500 B.C. These Indians wandered the wooded, pristine shores, hunting, fishing, and gathering food. Later, the Algonquin tribes occupied the area until the belligerent Susquehannocks chased them south. In 1652, the Susquehannocks made a peace treaty with Maryland settlers and eventually disappeared from the area as well. Land around the Magothy River remained relatively undisturbed until the l8th Century. But once the settlers realized this flat, fertile soil was ideal for tobacco and wheat cultivation, trees were cleared and farm land became a defining feature. The proximity of the Chesapeake and her major ports — Baltimore to the north and Annapolis to the south — made crop transport efficient and profitable. As the population grew, farms were sold and subdivided for residential development. Today, the shoreline of the Magothy is dotted with homes. Privately held waterfront property and surrounding developments have closed off virtually all public access to the river. 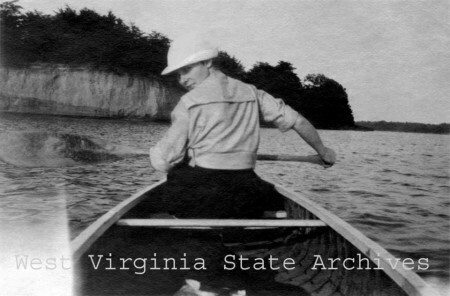 The photograph above was taken by a West Virginia surveyor who vacationed on the Magothy in the 1020’s and 1930’s. It was discovered in the West Virginia archives and shows the paddler headed towards Dobbins Island.